June and July 2016 will be remembered as bloody months which struck fear into whole populations living in the West. On 12 June, 49 people were gunned down in a gay club in Orlando, Florida. The next day, the 13th, a police officer and his partner were murdered near Paris by a man who had pledged allegiance to Islamic State (Daesh). On 14 July, a man drove a truck through crowds in Nice, killing 84 people, a number of them children, and leaving over 330 wounded. The attack was claimed by IS. On 18 July, in Germany, a young man aged 17 wounded five people, two seriously, in a regional train, attacking them with an axe and a knife. IS claimed the attack. On 22 July, shooting in a shopping centre in Munich. 10 killed. Again the gunman was very young -18. On 24 July, a new attack with a machete in Germany. A 21 year old man killed a woman in a restaurant in Reutlingen and fled, wounding others as he went. On 24 July, a Syrian refugee aged 27 blew himself up in the centre of Ansbach, near an open air music festival. On 26 July, near Rouen, a priest had his throat cut after hostages were taken in a church. Again Daesh claimed responsibility. “On Friday (during the killing in Munich) we could see how widely an ambiance of fear was prevailing. When the population learned that there had been an atrocity in a shopping centre in the north-west of Munich, scenes of panic were produced in the city centre, several kilometres from the crime. In Karlsplatz, people fled en masse in fear of a shooting that never happened. In the big Hofbrauhaus beer hall, people were jumping out of windows because there was a rumour going round that an Islamic terrorist was inside”. This climate of panic is obviously the fruit of a deliberate policy of the Daesh leadership, with its thirst for revenge. IS wants to destabilise its imperialist rivals by terrorising the population, But the list of violent actions in June and July reveals a wider and deeper problem. None of these killings were carried out by a well-trained Daesh soldier, far from it. They were the work of young men hardly out of childhood and feeling excluded from society. A violent father of a family coping very badly with his divorce. A refugee whom the state had refused to regularise. Their histories and origins are diverse: some were born in Europe, others in the Middle East. Nearly all of them were recently ‘radicalised’ and without any real direct links with IS, apart from a few videos on the internet. Some of the crimes had nothing at all to do with Jihadism: the Munich shooting was the work of a sympathiser of the extreme right, fascinated by Hitler; the machete attack in the Reutlingen restaurant was in the end described as a crime of passion. So the hateful propaganda of the Jihadists doesn’t explain everything; on the contrary, the success of their influence is itself the product of a much graver and more historic situation. What destructive, murderous force is pushing these individuals, with apparently such diverse motivations, to go into action? And why now? What does this barbarism tell us about the evolution of the whole of world society? These young murderers are not monsters. They are human beings committing monstrous acts. They have been produced by a world society that is sick, dying. Their hatred and their murderous intoxication have first and foremost been fermented by the permanent terror of capitalist social relations, then liberated by the pressure of this same system, exploding into a series of shameful deeds. “It’s no longer an accidental or secondary fact: its presence has become a constant at every level of social life. It impregnates all relationships, penetrates the pores of the social organism, both on the general level and the so-called personal level. Beginning from exploitation and the need to dominate the producer class, violence imposes itself on all the relationships between different classes and strata in society: between the industrialized countries; between the different factions of the ruling class; between men and women; between parents and children; between teachers and pupils; between individuals; between the governors and the governed. It becomes specialized, structured, organized, concentrated in a distinct body: the state, with its permanent armies, its police, its laws, its functionaries and torturers; and this body tends to elevate itself above society and to dominate it. In order to ensure the exploitation of man by man, violence becomes the most important activity of society, which devotes a bigger and bigger portion of its economic and cultural resources to it. Violence is elevated to the status of a cult, an art, a science. A science applied not only to military art, to the technique of armaments, but to every domain and on all levels, to the organization of concentration camps and the installation of gas chambers, to the art of rapid and massive extermination of entire populations, to the creation of veritable universities of psychological and scientific torture, where a plethora of qualified torturers can win diplomas and practice their skills. This is a society which not only “sweats mud and blood from every pore”, as Marx said, but can neither live nor breathe outside of an atmosphere poisoned with cadavers, death, destruction, massacres, suffering and torture. In such a society, violence has reached its apogee and changed in quality - it has become terror”. In other words, capitalism contains terror like the cloud contains the storm. All these barbaric acts carried out in recent weeks are the very negation of life – the life of others, the life of those who do the killing. But the ideology of Daesh in whose name so many of these attacks are committed, like that of the extreme right, are just a brutal caricature of the lack of value given to life by capitalism as a whole. The wars waged by all the big states are the most flagrant proof of this. Like the contrast between the opulent wealth accumulated in a few hands and the poverty which leads to starvation and death for millions. Like the medicines which draw together the highest levels of human knowledge but which can’t be distributed because it’s not profitable. Like the expensive commodities which are displayed in glitzy stores when millions live in a state of total deprivation. In the film Modern Times with Charlie Chaplin, there is a classic scene in which Charlie is manhandled by a crazed robot programmed to wash him, dress him and feed him to get him ready as efficiently and rapidly as possible so he can go and work in the factory. This is a humorous but ferocious critique of capitalism as whole, not only in the factory; because man is treated like an object in every aspect of his life, and on a daily basis. We no longer live according to our bodily, mental and social needs. Everything is conceived and organised according to the needs of capital and dominated by its rhythms. Capitalist exploitation more and more requires humanity to negate itself in order to incorporate itself into the machine. This robotisation of man leads to the exclusion of those who can’t adapt to the numbing rhythms of capital. The result is marginalisation, humiliation, a feeling of inferiority among those who are stigmatised as inadequate by the state, and through the repressive actions of its police forces or so-called ‘social welfare’ organs. There is no doubt that this is one of the deeper roots of the spirit of hatred and revenge. Terror and the negation of the value of life: this is the soil which gives rise to individuals who become terrorists. Sometimes materially crushed, with no hope in front of them, living in a totally restricted present tense, a daily mediocrity, these despairing individuals are easy prey to the bloodiest mystifications (Daesh, Ku-Klux- Klan, fascist gangs, gangsters and mercenaries of all kinds etc). In this violence, they find “the compensation of an illusory dignity. It is the heroism of the coward, the courage of the clown, the glory of sordid mediocrity. After reducing them to a most miserable condition, capitalism finds in these strata an inexhaustible source of recruitment for the heroes of its terror”. The Nice outrage on 14 July reveals clearly what lies behind all the others: hatred and the thirst to kill by pulverised individuals. 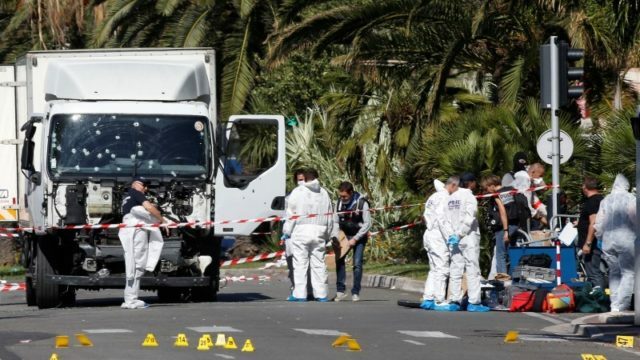 Mohamed Lahouaiej-Bouhlel, the man who used a truck to kill dozens of people in Nice, was described by those who knew him as ultra-violent, going through ‘crises’ in which he would smash everything around him. His ex-wife left him because of his extremely aggressive character. But to go further and to coldly run down men, women and children something else was needed: a real psychological disintegration. In such actions, all the fundamental taboos of human society crumble into dust. This man had internalised all the violence of capitalism, then externalised it in an explosion of destruction. Such mass murders have been around for several decades in the USA, where mass killings in schools and universities have frequently hit the headlines. Each time the killers are young people who feel themselves excluded and marginalised by the educational system, stigmatised by colleagues and teachers. The ideology of Daesh is thus by no means the primary cause of these barbaric actions. It’s because the system has first produced these broken individuals who are desperate for revenge that they become fascinated by the hateful and irrational discourse of IS and become obsessed with weapons. And it is at this stage that IS plays a considerable role: they enable these individuals to legitimise their barbarity. They make them believe that they can get revenge for their wasted life and win something through death. They release the most murderous impulses generated by this society. This succession of barbaric acts is all the more traumatic because some of the perpetrators are themselves victims of war, refugees or former combatants (official soldiers of the democratic armies, private mercenaries, young people who have gone off to fight for Daesh, al Qaida etc), people who are marked by deep psychic scars, haunted by all kinds of nightmares. Here the spiral is an infernal one: victims can be carried away by fear and hatred, by the most irrational kind of behaviour, and thus in turn give rise to further suffering, further traumas. This convergence of factors, to which we could ad others, explains the worsening of the social situation, Fear, hatred and violence are spreading like a gangrene. And each new explosion, each new terrorist outrage, adds to this suicidal dynamic. The spirit of revenge is everywhere. Racism and the scapegoating of Muslims is part of this vicious circle. This is in any case the strategy of Daesh: if the Muslim population is persecuted, the more recruits there will be for Jihad. The danger of this putrefaction should not be underestimated: if it is allowed to follow its logic to the end, it will push the whole of humanity towards destruction. Fundamentally, the bourgeoisie has no real solution for this dramatic historic situation. It’s true that its most intelligent factions make speeches about tolerance and the culture of welcome in order to limit the spread of hatred and prevent the situation from spiralling out of control. This is the case with the factions of the bourgeoisie led by Merkel in Germany. But the ones who are ready to manipulate fear and hatred are becoming increasingly numerous, playing the role of the sorcerer’s apprentices. Concretely, the most widespread response is to wage a more ferocious war in the Middle East, to build higher and thicker walls around Europe and North America in order to police (sorry, ‘securitise’) the whole of society, to put the whole population under permanent surveillance and to arm the police to the teeth. In other words, more terror, more hatred, everywhere, all the time. But even more fundamentally, the bourgeoisie has no real solution to offer because its aim is to preserve its system, capitalism, when it is this system which is totally obsolete and is at the root of the problem. Its world is divided into competing nations, into exploited and exploiting classes; human activity is determined by the interests of the profit economy and not by human need. All these obstacles are behind the accelerating decay of society. And no government in the world, democratic or dictatorial, can do anything about this. All of them defend a dying system which is dragging humanity through the most horrible suffering. The only counter-weight to this drift towards barbarism is the massive and conscious development of proletarian struggles. This alone can offer pulverised individuals a real identity, a class identity, a real community – that of the exploited and not the ‘believers’, a real solidarity, the solidarity that grows in the struggle of all workers, of the unemployed of all races, nationalities and religions, against their common enemy, not against the Jew or the Catholic priest or the Muslim or the gypsy or the unemployed or the refugees, not even the banker, but the capitalist system itself. It’s the class struggle alone that can give rise to the one perspective that can save humanity from barbarism: the overthrow of capitalism and the creation of a communist society.